Police investigate outside an east Detroit barbershop where ten people were shot Wednesday. Authorities were questioning a man who was wearing body armor when he was detained Thursday in connection with the shooting deaths of three people at a Detroit barbershop — an attack police called "urban terrorism." 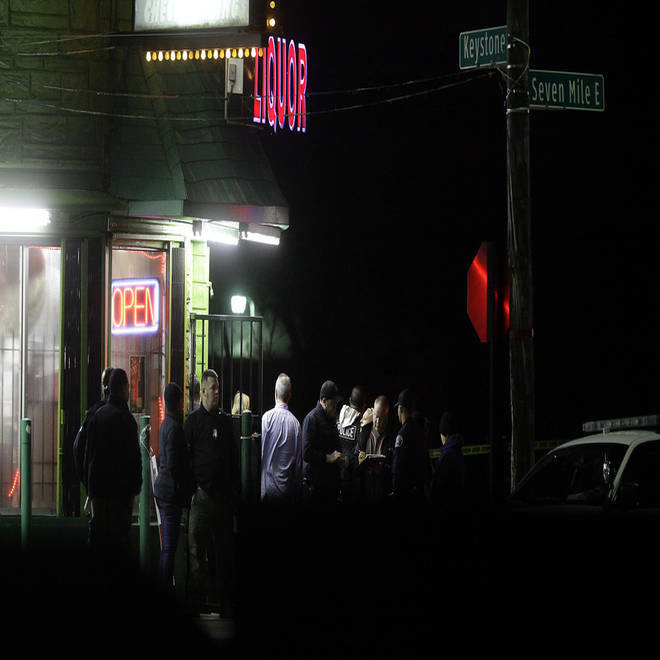 Twenty to 30 people were packed in a back room in the back of Al's Barber Shop when the gunman pulled up and opened fire with a high-powered assault-style rifle on a truck Wednesday night, Detroit Police Chief James Craig said at a news conference Thursday. Soon, the back door opened, and the gunman began firing inside the barbershop, Craig said. Many people in the room were armed, and at least one returned fire, he said. "There was a machine gun. It wasn't no regular handgun," a witness told NBC News. Three men — identified Thursday as Joezell Williams, 61; Kevin Perryman, 40, his stepson; and Bryian Williams, 29, his nephew — were killed and six others were wounded as they poured out into the street fleeing the gunfire. "The shooter struck nine of the individuals inside the location," Craig said. "... This was certainly a violent act, basically what I'm calling urban terrorism." The barbershop's back room is a known gambling location, and "there was an ongoing feud between a particular individual and several members of the gambling party," Craig said. Craig gave few other details, saying the investigation was still in the early stages. But he said investigators were hoping to learn more from a man who was arrested Thursday in Rochester, a northern suburb, on an unrelated felonious assault charge. Craig described the man as a "person of interest," not yet officially a suspect. But he said investigators — including police and agents of the FBI and the U.S. Bureau of Alcohol, Tobacco, Firearms and Explosives — had determined that the man may have been involved not only in Wednesday night's shootings, but also in at least two other violent assaults. The man, a convicted felon, was wearing body armor when he was arrested, Craig said. "Police wear body armor. Why would a community member be driving around in body armor?" Craig asked. Police were also seeking a black 2004 Chevrolet Impala and a white 2004 Impala with a broken window and bullet holes in the rear. Witnesses told NBC station WDIV of Detroit that a 6-year-old boy was getting a haircut and a 5-year-old boy was waiting for his haircut when the shooting started. The barber grabbed both boys and bundled them off to safety in another room, said the witnesses, who called the man a hero.